I first tried the Make Up For Ever (MUFE) Aqua range at the Make Up For Ever Academy and fell in love instantly. Everything I've tried from that range were gorgeous on the skin. I also got one of the Aqua Shadow which is an eyeshadow on a stick. The colors, the textures, the overall quality are top notch, just like what we expect from a higher-end brand such as Make Up For Ever. There are a few type of items from the Aqua range but being an eyeliner junkie I decided to try one of their eyeliners which is the Aqua Liner. According to their website, the Aqua Liner is a high precision waterproof liquid eyeliner. Rich in pigments and polymers, its formula guarantees intense color and an outstanding waterproof result. I've tried their blue turquoise color at the MUFE Academy and many people commented on how gorgeous it looked on my eyes, so when I'm thinking of what color to try out I decided to get the Aqua Liner in shade #5 which on the website is described as "Diamond Turquoise Blue". First of all, I always love the carton/box packaging of all MUFE products because they look so sleek and elegant with an overall black color with white fonts. I think most of the higher-end brands have similar packaging like this and I can't blame them because this classic combination does looks very exclusive. Now let's talk about the product inside the carton/box packaging. The product comes in a tube and the tube itself also looks sleek with an outer color resembling the color of the actual product inside. This way, you wouldn't have mistaken it for other colors. This liquid eyeliner has a pointy tip brush which is pretty soft and not stiff at all. 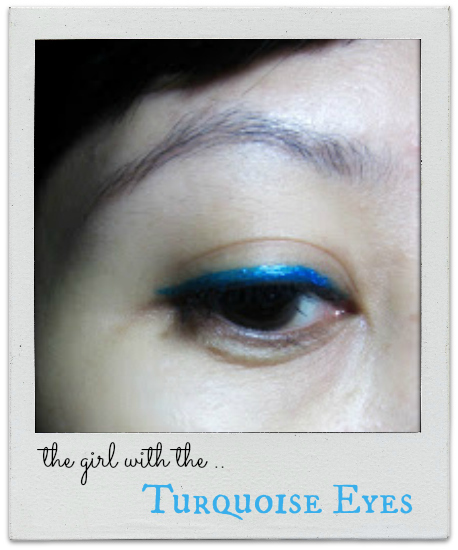 This makes it easier to maneuver and control how thick or how thin you want your eyeliner to be. The formula dries pretty quickly on the eyelid so it reduces the possibility of smudging everywhere. And as I told you above, the special applicator is very ergonomic so it's possible to easily apply an ultra precise line on your eyelid. I love how the color is so vibrant and true to shade. It is also waterproof and I might add "also oil-proof" because when I wore this for more than 6 hours it didn't budge, smudge, or melt on my oily eyelid. I also did a water test for the purpose of this review. You can see on below photo that the color is still there although I have poured water over it and even rub it lightly a little bit. I'm sure that from my review above you can see how great the quality of this eye liner is. Aside from the formula, the easy application and the waterproof feature I also really love the color of this one because I almost always receive compliments every time I used this eyeliner. Aside from the color above, this Aqua Liner is also available in a wide range of vibrant shades with matte, iridescent and diamond finishes. I saw the Diamond Multicolor Black shade on the website and now I'm very curious with the color ;p It's definitely on my wish list now. Oh one more thing, I have an information from MUFE that they would like to extend their sincere apology to all of MUFE fans out there in Indonesia regarding the low stock condition that they previously had since last December. Like many other importers, they were facing a very tough situation with the new Trade Regulation. But rest assured now, because the MUFE team has overcome the obstacles and had complied with all and any new regulations from the government. Make Up For Ever is now back in full force, returning once again to the normal stock level so that they can provide us (their customers) with our favorite products again. Yay! Thank you for your professional service, Make Up For Ever! Sure, I will stop by your blog right after this yaa..